When it comes to buying living room furniture, leather is always a smart choice. Not only does it look good with most styles, but it’s extremely durable (it’s the perfect material for a household with kids or pets) and it’s ultra-easy to clean, too. The downside of leather furniture? It can have a much higher price tag than fabric, microfiber or faux leather furniture. This reclining loveseat remains a budget-friendly option because of one genius trick: its seating area is upholstered with leather, while the sides are upholstered with more affordable faux leather. That means you get the look and feel of a full leather loveseat without the hefty price tag. Use the lever on the loveseat’s arm to kick back and relax on its high-density foam filling, and think about all the money you saved. This particular loveseat comes with an added bonus: professional assembly is available in many areas of the country for an additional fee. This reclining loveseat takes the second spot because it’s a super affordable, super comfortable option that can fit in with most home décor styles. Its solid wood frame is padded with coils (for some spring) and high-density foam (for some soft), and upholstered with dark brown faux leather that makes it an ultra-versatile piece of furniture. Add it to the man cave for a comfy spot to watch the game (and don’t worry about any spills—its vinyl upholstery makes cleanup easy) or your living room with a couple of decorative throw pillows for the perfect place to cozy up after a long day. Real-life customers love this reclining loveseat because it’s comfortable, durable, easy to assemble—one reviewer even noted that she was able to assemble two units in under 45 minutes!—and shipping from the vendor is a breeze. If you’re looking for some serious relaxation, this loveseat’s solid pillow back and rolled arms will deliver—but at a higher price tag. Each seat cushion contains 30 individual pocketed coils for spring and support, and high resilience seat foam for an extra layer of plushness and durability. Plus, the foam cushions are topped with super soft, blended down feathers. For your additional comfort, there are three standard positions: sitting, a slight recline with an elevated footrest, and a full recline with an elevated footrest. It doesn’t hurt that this reclining loveseat looks lux, either. Its all-leather upholstery and decorative nail head trim give it a classic look that can work with lots of home décor styles, from traditional to country to arts and crafts. Plus, leather holds up well against everyday use, kids and pet hair and nails. Just remember to condition the leather every six to 12 months. Coming in at under $300 (plus shipping) and 56 inches in width, our wallet- and space-friendly pick is ideal for first apartments, playrooms, dens or other small spaces. Because it’s upholstered with extra strong bonded leather, this reclining loveseat is more resistant to stains, rips and tears. Customers describe this reclining loveseat as comfortable, stylish and an excellent value. One reviewer wrote that it was one of the most comfortable pieces of furniture she’s ever had, while another said he couldn’t have asked for more for his money. Fair warning, though: some reviewers said the upholstery on their loveseats tore very easily. Fortunately, the manufacturer has a warranty for parts. Because this loveseat has such a simple design, it makes a solid base for more personalized décor items. Add some decorative throw pillows or blankets to up its cozy factor, and add a few pops of color and pattern. Puffy, overstuffed loveseat cushions aren’t your thing? This reclining loveseat from GDF has sharper, cleaner lines than your traditional reclining loveseat, making it a stylish addition to a mid-century modern, contemporary, eclectic or modern style of home. And, at only 46.46 inches in width, it’s easy to squeeze into a smaller space, like apartments, dens or office spaces. Available in several color and fabric options, including charcoal fabric, navy fabric and slate microfiber, it’s easy to find the perfect match for your home décor, and the durability your family needs for everyday use. Gone are the days of good-looking, but uncomfortable furniture; you no longer have to sacrifice comfort for style. This reclining loveseat features an oversized, soft, plush-filled seat cushion with enough space for two—or enough space for one to spread out and relax. Although this reclining loveseat comes with a heftier price tag, its classic design, options for customization and automated reclining system make it well worth the dough. Its handcrafted wooden frame is padded with down blend cushions for a softer feel than you’d get from high-density foam cushions, and the upholstery is available in a whopping 72 color and fabric combinations. 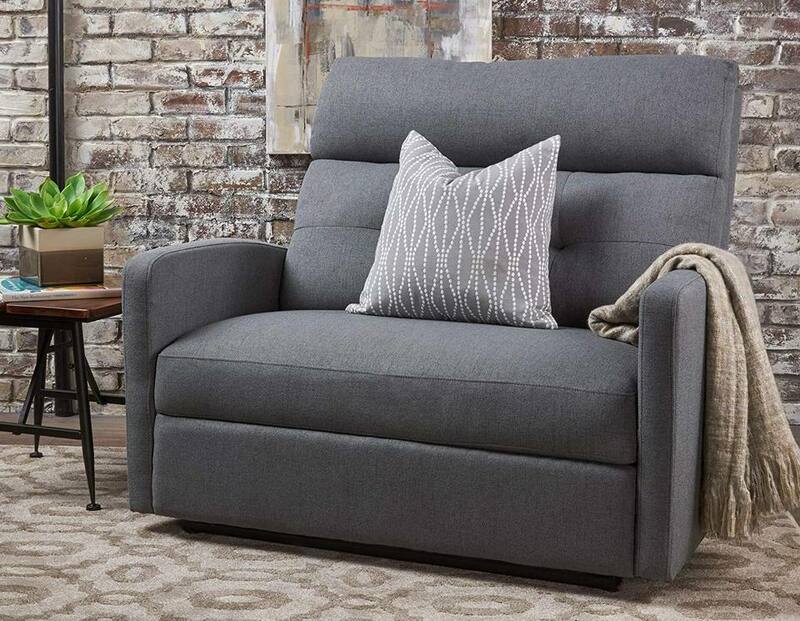 The availability of so many options makes it extra easy to pair this reclining loveseat with different patterns, materials, accents and décor styles. Plus, if you have kids or pets (or both! ), you have the option to choose a more durable, stain-resistant fabric. One customer shared that the Sunbrella canvas material has held up well against her children and pets. This reclining loveseat may have a classic, old-school look, but its built-in tech is anything but. Not only does it have an automated reclining system (that will give you a full recline, with your footrest totally parallel to the seat), but it has a USB port for using—or just charging—your iPad, iPhone, Kindle or laptop. Upholstered with ultra-durable bonded leather, this reclining loveseat will resist tears, rips and stains—which is a good thing, because it also features a storage compartment console (where you can hide your snacks, of course) and a two-cup holder. Whether you’re settling in for a Netflix binge or watching football with your crew, this reclining loveseat offers the comfort and durability without breaking the bank.